The world has been closely following the Belt and Road Initiative (BRI) since it was announced in 2013. The idea started with developing a platform and financial mechanisms that would integrate developing nations into China's drive for a more cohesive economic policy and build much-needed infrastructure that developing nations need to make the jump to the fifth industrial revolution and take part in the 21st century economic framework. In South Asia, the Belt and Road Initiative is seen as a main driver for infrastructure construction in a region that must bridge the ever-growing gap between its economic potential and the realities of its insufficient infrastructure. According to the World Bank, South Asia requires about $2 trillion of investment in infrastructure construction from 2011 to 2020 if the region wants to be part of the new economic order shaping the future. This is exactly what policymakers in China are offering to South Asian countries through the BRI. A look at the projects accomplished so far demonstrates clearly how China integrates its foreign development projects with the UN's vision. From Sri Lanka and the Maldives to Pakistan, the projects already in place show the concrete results of the initiative. The Padma bridge in Bangladesh will connect 21 southern districts with the capital. The Colombo Port City project in Sri Lanka presents another important step in the BRI. Jointly developed with China, the $1.4 billion port is establishing itself as a major economic hub for the country's trade and connectivity at the local and regional level. Finally, we can cite the Gwadar Port in Pakistan, part of the China-Pakistan Economic Corridor (CPEC), which is itself a major achievement for regional integration and an example for other regions to study and understand its economic vision. With more than $50 billion invested in the project, the BRI has achieved its true meaning: regional development and international integration. It is a real infrastructure corridor: a deep-sea port, highways and airports supporting the faster and safer flow of goods, services and people between these nations. 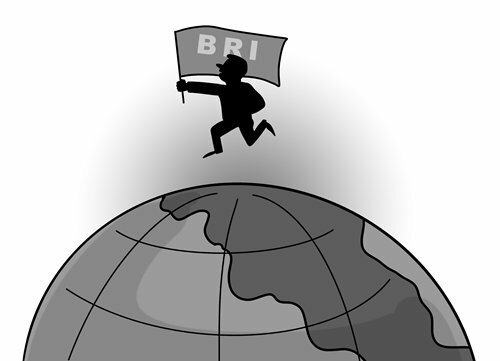 True to its global status and inclusive nature, the BRI is not merely a regional initiative. Africa can be considered a major beneficiary of China's economic drive to support the continent's development and to help its infrastructure and economy achieve targeted growth plans. The year 2018 could be considered the turning point for the BRI in Africa as the signing of the MOU of cooperation between China and 37 African countries and the African Union raised the initiative to a new level. Infrastructure financing provided by China to Africa averaged $11.5 billion between 2012 and 2016. Examples of China-backed projects on the continent include the $5.8 billion Mambila Hydropower Plant in Nigeria, the Addis Ababa-Djibouti railway, the $11 billion port in Bagamoyo, Tanzania now under construction, and the Nairobi-Mombasa railway project. Another project that is moving forward and may have the same implications as CPEC has in South Asia is the Suez Canal corridor in Egypt. Through the signing of a BRI MOU, Chinese investors are expected to provide extra capacity to revitalize the Egyptian economy, linking it to the rest of Africa and the Middle East. All these achievements so far have focused on the global macroeconomy, but there is another important effect the studies and media have neglected to focus on that would change the lives of many people. We have to broaden our understanding of the initiative, not just as links between state actors, but also between cities and local businesses. The stakeholders of the BRI reach beyond the traditional institutional players in international development as people and small businesses have become the center of the project. The world is entering a new era of equitable market access thanks to lowered costs of shipping and transportation through sea lines, railways and highways, global networks of mobility and access to previously impossible to reach hubs. Having said that, I personally believe the BRI's strongest element is the fact it did not define itself through rigid principles or outcomes. It is a truly new paradigm in international cooperation in which the stakeholders, including China, define success through the resiliency of the platform, the ability to meet needs as they emerge, and refusal to rush through projects. This may be why many nations in the West are uneasy with a paradigm shift in international development cooperation. There are issues with any project like the BRI, such as debt, misuse of funds, and questions of sovereignty. China has long been a mystery to much of the world, perhaps due to its language, culture and, of course, negative propaganda from some media and governments. Perhaps this is an area Chinese policymakers have to face and find a suitable way to project the good-faith nature of China's international engagement. The world's diversity can be challenging, and misunderstandings are the norm in this culturally diverse environment.